Between 1585 and 1594, the sanctuary of Freiberg Cathedral was redesigned to a splendid burial place of the princes of Wettin, following the plan of Giovanni Maria Nosseni (1544�1620). At that time, the angels putti � at a height of twelve meters � were attributed musical instruments. Most of the 30 wind, plucked, string and percussion instruments 400 years ago must have been playable; and their state � without modification over all those years � makes them a completely unique ensemble of the 16th century and a singular document of Saxonian Renaissance. By using of modern research methods, the instruments were documented in detail. Thus, the stage was set for the construction of playable instruments, true to the originals, by the use of the traditional techniques. The research project (run at the 'Georg Kinsky e.V.' research institute for musical instruments) attracted wide interest from all around the world, with the completely innovative concept of giving the built copies to selected interpreters trained in historically informed performance. The five violin instruments were given to the ancient music specialist Susanne Scholz to be played - in 2005 she founded the Chordae Freybergenses ensemble just for this purpose. The ensemble only plays on the copies of the renaissance instruments. 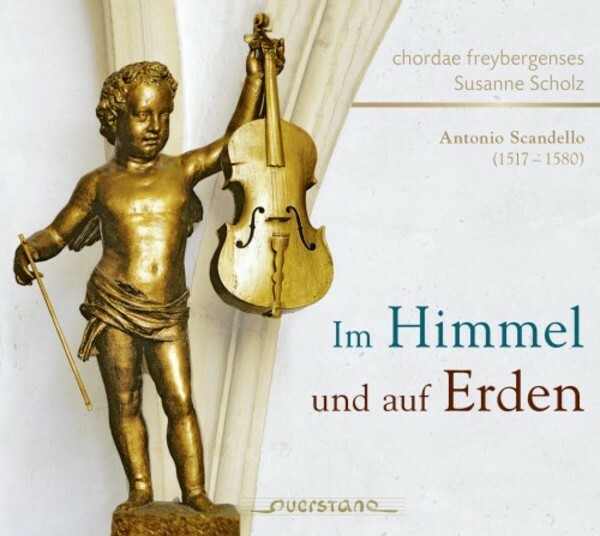 This recording of compositions by Saxonian Court Music Director Antonio Scandello (1517� 1590) presents the research results at a unique artistic level. Parts of the recording were realized within the authentic atmosphere of Freiberg Cathedral.